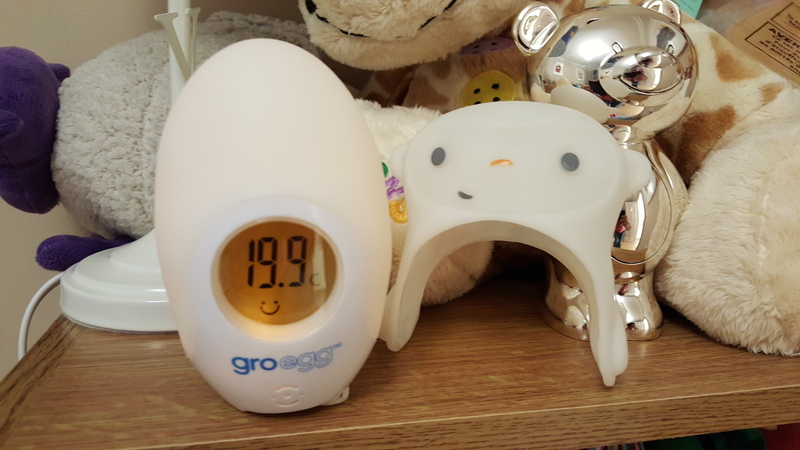 I had seen the Gro Egg in John Lewis and had it stored in my mind, so when it came to thinking about a digital room thermometer, the Gro Company was the place I turned to. I promptly ordered it and installed it in BattleKid’s room on his shelves where we could see it but where the night-light wouldn’t disturb him. And it has proudly sat there ever since. 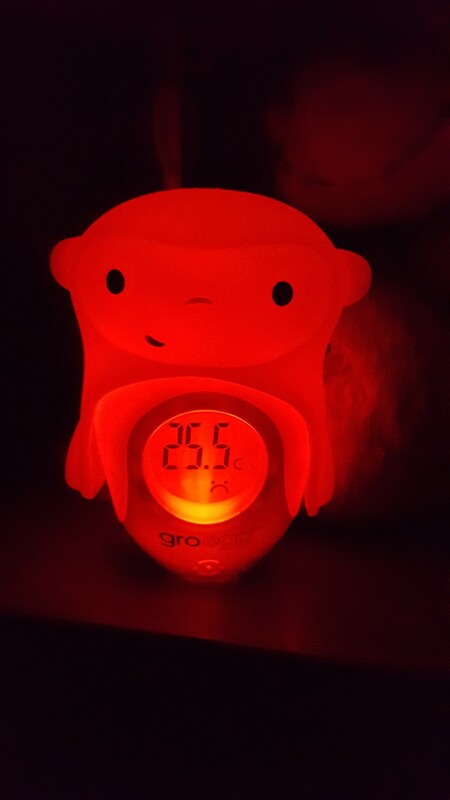 It’s been great peace of mind as it accurately tells the temperature of the room so I know when to change the tog of his Grobag or his bed-clothes. The colour of the night-light changes according to the room temperature and there is even a smiley or sad face to accompany the temperature display. – below 16°C is considered cold and the Gro Egg turns blue. The temperature readout is accompanied by a sad face. – between 16 and 20°C is considered the ideal temperature for your baby for comfortable and safe sleeping. In this case the Gro Egg is yellow in colour with a smiley face on the display. – between 20 and 24°C is considered warm and the Gro Egg is orange in colour, almost acting as a warning! – over 24°C is considered hot and the Gro Egg glows red with a sad face. – heat or cool your baby’s room. – adjust the clothes they sleep in. – adjust the tog of their Grobag, or adjust the number of sheets/blankets you use for them. 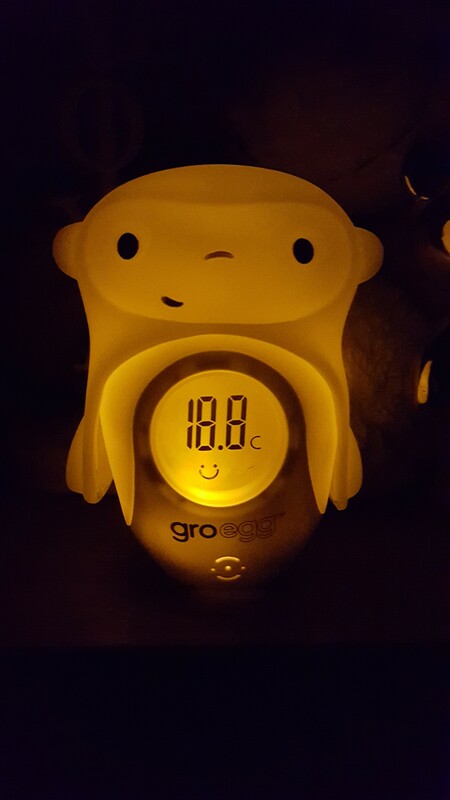 The glowing colour of the Gro Egg also acts as a great night-light. It isn’t too bright as to disturb your baby and is just enough for you to be able to see in their room without the need for another light. The digital temperature reading is very easy to see at night but maybe a little harder during the day if the sun is quite bright outside. However, this isn’t a big deal as you may want to use the Gro Egg mostly at night for bedtime like me. At nap times during the day I’ve simply stood closer to the Gro Egg or in front of it to see the display easier. But that said, I’ve never really needed to heed it much during the daytime for naps. 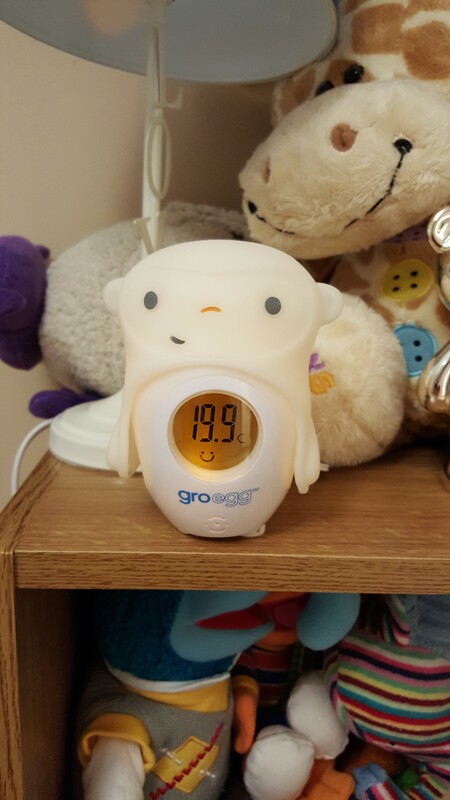 As mentioned already this room thermometer is quite accurate, much more so than our baby monitor and this is important for peace of mind, especially for mums who might need to move their baby into their own rooms at an early age for whatever reason. The Gro Egg also conforms to both British and European Safety Standards, a big plus in my scientific minds book! The only thing you’ll need to bear in mind with your Gro Egg is its placement in the room. Direct drafts or heat (such as from radiators) may affect the temperature reading so you won’t want to place it near either of these. Also, the Gro Egg is mains operated so you’ll need to have access to a socket for it. That said its lead is quite long. I’ve loved our Gro Egg since we first got it and even more so since we added the Mickey Monkey Gro Shell to it as it ties in nicely with the Next Cheeky Monkey theme we have going on in BattleKid’s room. – nothing. The only point to note is placement in the room as mentioned. The Gro Egg has been an invaluable addition to BattleKid’s nursery and gives us help in dressing him correctly for bed. It also gives us peace of mind that we’re doing things to aid a comfortable and safe nights sleep for him. You won’t go wrong if you decide to add a Gro Egg to your little ones nursery or room. The Gro Egg and Shell characters are available via the online shop of the Gro Company website or through other major retailers such as Amazon, Argos, John Lewis and Mothercare, to name but a few. I was not asked to write this post.